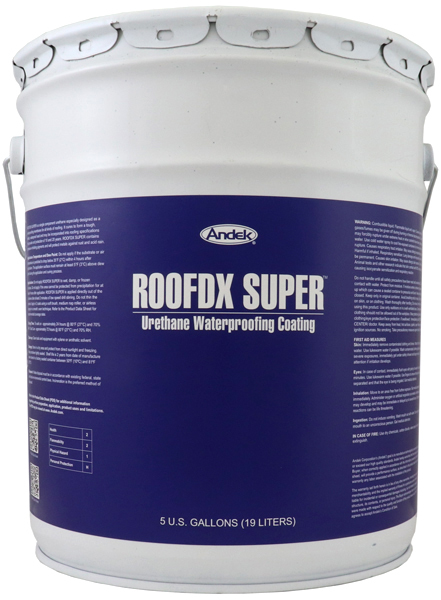 ROOFDX SUPER is a single component urethane especially designed as a waterproofing membrane for all kinds of roofing. It cures to form a tough, elastic, waterproof seal and may be incorporated into roofing specifications that provide roof protection of 10 and 20 years. ROOFDX SUPER contains corrosion-inhibiting pigments and will protect metals against rust and acid rain. Can be used over BUR, asphalt or coal tar, EPDM, rubber, wood, concrete, brick, masonry, copper, steel, aluminum, tin, mineral composites and other approved surfaces. Do not apply ROOFDX SUPER to wet, damp, or frozen surfaces. Do not apply if the area cannot be protected from precipitation for at least 4 hours after application. ROOFDX SUPER is applied directly out of the container after at least 2 minutes of low speed drill stirring. Do not thin the product. Apply in 2 coats using a soft brush, medium nap roller, or airless sprayer in a smooth, even technique. Achieved by embedding ROOFAB into a fresh coat of ROOFDX SUPER applied at 15 mils wet thickness. The fabric is then saturated with a second application at sufficient thickness to remove all voids, fishmouths and dry spots. Bolt heads on metal roofs should be daubed with K-CATALYST modified ROOFDX SUPER until they are completely encapsulated. As soon as the K-CATALYST ROOFDX SUPER has set, it should be coated with a compatible topcoat. Requires good preparation as described above. If gravel is present, this should be removed by wet-vac or scraped off and pressure washed. BUILDKOTE or compatible flood coat should be installed to soften the profile of embedded gravel. Application of ROOFDX SUPER may proceed by embedding 40” ROOFAB into a fresh coat of ROOFDX SUPER applied 1½ gallons per 100 sq ft (66 sq. ft. per gallon); the fabric should be smoothed out without stretching so that it conforms to the surface without voids, tents or dry spots. Begin at the lowest point of the roof and each roll saturated with an even coat of ROOFDX SUPER at 1½ gallons per 100 sq ft (66 sq. ft. per gallon) as soon as the first coat has soaked up and no wrinkles remain. Enough material should be present at the overlap that saturation occurs completely without fishmouths or dry spots. Continue application with laps facing downhill to shed water if work is interrupted by precipitation. Sudden precipitation will not wash ROOFDX SUPER off when wet or newly applied, but will produce a mottled, dull appearance that is not detrimental to overall performance. ROOFDX SUPER should always be coated with a suitable topcoat and if solar panels or other overburden is installed, use appropriate separation layer. To walk on – Approximately 24 hours @ 80°F (27°C) and 70% RH. Total Cure – Approximately 72 hours @ 80°F (27°C) and 70% RH. Clean tools and equipment with xylene or aromatic solvent.